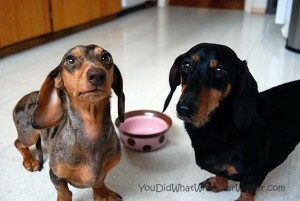 When we announced that we were switching to grain-free kibble the support was overwhelming. I didn’t have one person say it didn’t work for them. Everyone had rave reviews and said it made a big difference. A lot of those people offered some good advice. Jenn ay Health Mutt and Kol’s Notes gave me the low down on the issue of going grain free and potential weight gain. Jenn said the basic equation she explains to people about the difference in grain-free foods is that, generally speaking, the more meat in a grain-free food and the less binder (be it potato, pea, or tapioca) the less you feed. Kol added that you should definitely make sure you read the bag label for serving sizes when you switch, it’s not just a myth – they should get LESS of the grain-free food because it is more nutritious – to make sure that they don’t gain weight (unless that is your goal, like us). We ultimately decided on Acana Grasslands and I checked the recommended serving sizes on the package. We were already feeding the amounts listed within their range of our old food. I decided to keep their portion sizes the same and just watch them. Our vet recommended that Chester rand Gretel both gain a half pound but I don’t want them to gain much more than that. I figured they would be getting more nutrition out of the same serving size so theoretically they should gain weight. Two weeks into it I would say that I haven’t noticed Chester gain any weight and maybe noticed Gretel gain a little. It’s only been two weeks though so I didn’t expect to see much of a difference. Kol also mentioned to us that we might notice some initial gassiness as the intestine gets used to producing the correct stomach enzymes again. I would say this has definitely been true these last two weeks! I think they have farted more these last two weeks than all of last year and it has been especially stinky. Kol suggested that a scoop of canned pumpkin or, if they are dairy-tolerant, plain pro-biotic yogurt might help. If they continue to be little gas bags I just might give it a try. I have noticed one huge difference and that is in their level of energy. They are bugging me for walks more often and seem spunkier around the house – “Full of piss and vineagar”. They are always go-go-go when we are hiking, and we haven’t had much chance to get out in the last two weeks, so I can’t say I notice a difference on the trail at this point. Two weeks is not that long. I have been told by several people that you need to try a new diet for 6 weeks to really see any differences. We are going to continue to track the changes and will continue to keep you updated. Huh. I had no idea there was a link between grain-free and weight gain. If anything I would have expected it to be the opposite. Now I am wondering if this may be a good idea for us and we seem to have trouble keeping any weight ON our dog. Grain free food often has less fat so that plays into it too. We just picked up a bag of Taste Of The Wild to gradually move 8 month old Arnold off puppy chow on to adult dog chow. I can only hope it stops his flatulence because he’s a real geshtunker. Any hints on the timeline and increasing ratios to ween him off the puppy chow? Well, I am no expert but this is what I do. I feed them about 1/3 new food with 2/3 old for a week, then half and half for a week then 2/3 new with 1/3 old for a week then all new. Chester has a strong stomach though so when switching between traditional kibbles I start right off with half and half and back off if I notice any problems. If I don’t notice any then I got to all new after a week. Switching from grain to grain-free is a big difference on their tummy though so I did the gradual change I first suggested. How interesting that you’ve found they are spunkier! When we were looking for a new food for our boys after theirs was discontinued we put them on one food that made Buster act like he’d spent the morning guzzling shots of espresso. For us, it was unbearable and we had to move on to another food. Hopefully your experience (other than the gassiness) is metter than ours was! Is Gretal stinkier than Chester? I’ve always found female dogs fart way more than boy doggies. Eleanor is a real stinker sometimes. Glad things are going well so far! Oh I always spell Gretel wrong, I even remembered right before I posted! Sorry! Chester and Gretel are usually close enough together that it is hard to tell. I think that Chester comes out ahead in the end though. Ha, ha. Sounds like your on the right track. To bad about the farting though, Roxy and Torrey didn’t go through that when we switched. When I switched mine to grain-free they started pooping more. On average, 3 times a day, and that’s a normal size poop. They did fart more, the smell doesn’t last long, tiny dogs, tiny farts. Grain free food is funny thing! For Fe, it pepped him up and he had so much extra energy (like your two). For Kol, who tended to be a little nutso to begin with, it mellowed him out. He no longer gets that high-carb UP where I want to pull my hair out! LOL, glad to hear it’s going well! I can’t wait to hear more as they’re on it longer!